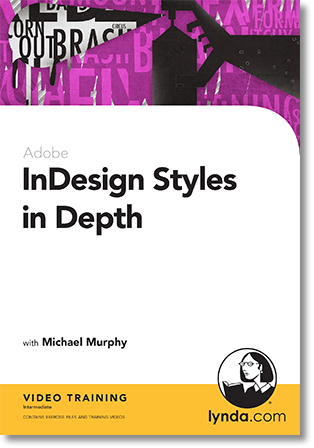 InDesign Styles in Depth covers the ins and outs of styles, a time-saving set of features that allows designers to maximize efficiency in InDesign. This course covers text styles, table and cell styles, object styles, and every feature in InDesign that is improved by the use of styles. Author Michael Murphy explores the use of character versus paragraph styles as well as advanced text formatting with nested styles, multi-level lists, table manipulation, cross-references, and creating a table of contents. The course also covers how to map styles upon import and export, whether taking documents to the Web with HTML and CSS, publishing them as EPUBs, or distributing them as PDFs. Exercise files are included with the course. Below are some sample movies from the InDesign Styles in Depth. Viewing the full course requires a paid Lynda.com account. For a 24-hour free pass to the Online Training Library, click here.